In 1921, the house was occupied by a party of Republican soldiers. According to local legend, a silver salver (plate), which had been in the family since 1467, was taken during this occupation. Thomas Boyd, Earl of Arran, received the salver on the occasion of his marriage to Princess Mary, daughter of King James II of Scotland. The family crest was inscribed on the salver. well kept and extensive gardens embellished by the pine walk near the house, comprising a variety of rare conifers, amongst which are some of the finest specimens in Ireland. Unfortunately in 1941 the trees were felled by the new owner for timber. Subsequently no replanting has taken place. Interestingly the sale price of the house in 1941 was less than £2,000, whereas in 1785 the sale price was £3,000. The house passed out of the Boyd family on its sale to the Kelly family in 1941. The Ballymacool Estate was sold in the mid 1980's by the Kelly family and since 2000, it has been gradually sold off in lots to housing developers. Despite the efforts of local conservationists to restore the house as a heritage centre, the construction of over 500 houses is well underway. Planning permission has been granted recently for the conversion of the West Gate Lodge to a public house. Still visible are the remains of pathways, walled gardens and orchards. Rare trees include a huge Wellingtonia, a Coast Redwood and a Western Hemlock. Several of the Boyd family are buried on the estate. 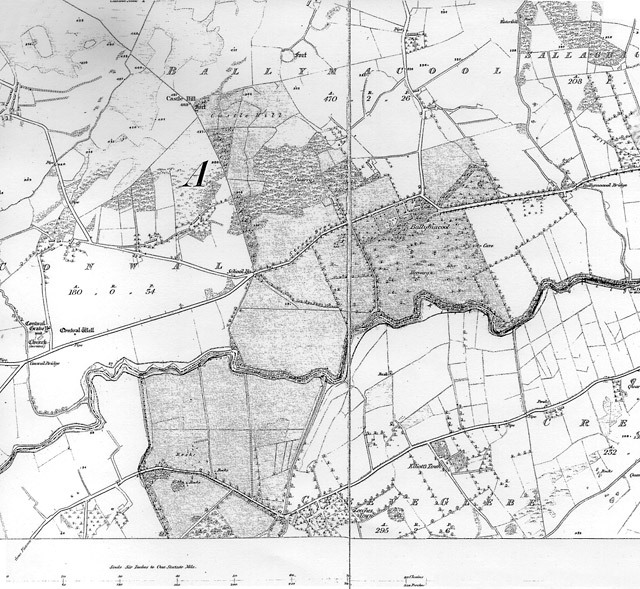 The map below shows the house, the extensive grounds and the woodlands of the Ballymacool estate. The School House was rebuilt around this time, replacing the original, built in 1770. The stone used in the building of Ballymacool House was taken from a quarry shown top left of the map. The same stone was used in the building of St. Eunan's Cathedral, Letterkenny in 1891.